The tiniest surviving baby boy in the world has been released safely to go home after months in the hospital. Back in August, the infant was delivered prematurely. He had stopped growing in his mother’s womb. Doctors at a Tokyo hospital feared he would not survive unless they intervened. Though he weighed just 268 grams (about 9.45 ounces) at birth, his caregivers believed he needed to be nourished in the hospital to live and grow. Other very tiny premature babies have also been tracked to health after being born frighteningly early. The Tiniest Babies registry keeps track of those. It is a database managed by the University of Iowa. Prior to this Japanese baby boy, the record for smallest surviving boy was held by a baby born in Germany in 2009. His birth weight was slightly higher at 274 grams. 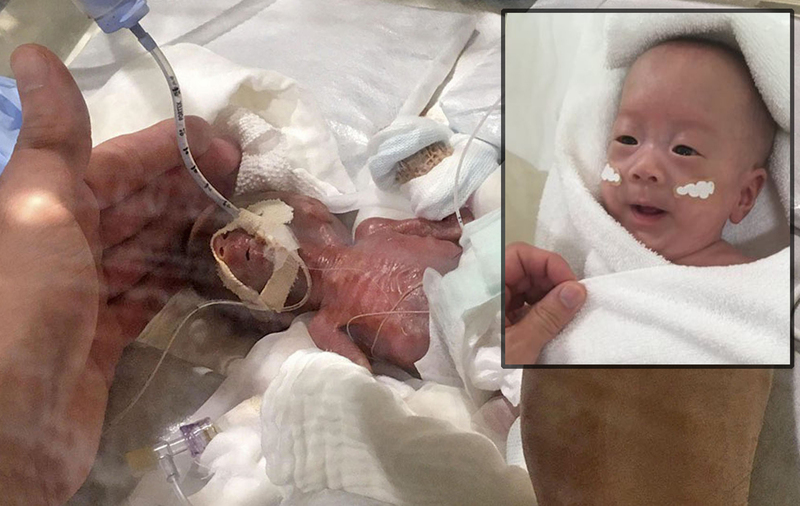 The smallest girl was born in Germany in 2015. According to the registry, she weighed 252 grams. That is barely more than half a pound. The registry is not the only way these most fragile and vulnerable of people are tracked. God keeps track of every human life. Every child and every adult is made in God’s image. Every life is sacred to Him, and every life is known. OH. MY. HE IS TINY!!!!!!!!!! OH. MY. HE IS TINY!!!!!!!!!!!!!!!!! That's interesting because he is a baby CHINESE boy. I wonder if the parents had to pay a fine!!! That's crazy!! Comparing the two pictures convinces me that that boy is a living miracle. Alyssa s he’s not Chinese it says he’s Japanese in the article. if he was Chinese. Lets he wasnt the 2nd child! Let's start on this one!!!! Anyone else agree? but lets wait a while until WORLDteen fixes their problems. I can't believe it! that's mind blowing! I understand why the mother was so worried. Also, what are u guys talking about? He is so tiny! It is a miracle that he is alive! Please do not use the comments area as a personal chat room or to simply compile the greatest number of postings. The comments function was not designed for that. It is provided as a service for readers to share feedback that is relevant to the news story and pertinent/appropriate for all readers. We appreciate your cooperation in making the comments a safe and relevant feature for the WORLDteen news site. Awwww! He’s so cute!! I’m so glad God protected that little baby! wow!!!!! !five doys after birth!!!!! he's tiny!!!!!!!!!!! praise God he servived !!! i was born early to; ) the doctors thoght i would die too but here i am!!!!!!!!!! If the world teen bord seas not to make 500 or 1,000 comment then DONT DO IT!!!!!!!!!!!!!!!! you will get in troble!!!!!!!!! By the way, everybody, in case you didn't check on the article, "when is gaming too much", Matthew H. just commented that the whole thing was made up by him!!! So I guess it's still ok to comment on there. Abuse of the comments feature may result in postings being deleted, or the reader’s commenting privileges being revoked. Very sorry for the joke; I am very sorry WorldTeen. You have my sincere apologies. I am the one who posed as the Staff, and I only meant to kid around. I am very, very sorry and I will change my behavior from now on. I am open to criticism; you are probably wondering why I did it. Well, to tell the truth, I was upset at seeing very lengthy and non-informal comments being posted, and so I decided to put a "stop" to it. WorldTeen, please do not revoke my commenting privileges because my brother and I share the same account. Yes, I know, it was un-user-like to pose as a Staff member. I am very sorry and you may expect me to be a better commenter. That was very mature of you, Andrew, I think that you are a good person and I am impressed by your honesty. I speak for myself, and I believe that other WOLRDteen readers will agree, I don't think Andrew should have privileges taken away. This is no excuse, but, he was only kidding and didn't know that it would lead to trouble. We all make mistakes, and there are consequences. Sometimes we have to learn the hard way, but I can tell you this WORLDteen Staff, Andrew, my fellow readers, and I will be more careful about how we comment and the way we use our words. Please consider letting Andrew keep his commenting rights. Wow! You took the words right out of my mouth. God had his eyes on this beautiful baby boy, and has amazing plans for His life! I'm so glad he has a chance to live that life. I agree with you Alaina F., that was kind of childish to try to make 1,000 comments, and make the longest comments!! You certainly didn't offend me, and, editors of WorldTeen, I'm very sorry, because I was kind of in the middle of everything, making comments and all. (Of course, If I would have known or looked into it more that it's not allowed, I would have stopped right away.) I also agree that you shouldn't take away Andrew's commenting rights. WOW!! !how did you do that?!! I think it just shows what a great God we serve!